How to get the best results for your upcoming UNISA assignments 2014! How to get the best results for your upcoming UNISA assignments 2014! It`s already February, and the UNISA term is in full swing. We have been getting a lot of comments from students who are overwhelmed with their UNISA assignments 2014 – many of whom have not received their books on time due to the MyUNISA downtime, and the then the SAPO strike. This blog aims to give you a little help with how to manage your assignments to ensure you get top results. We also invite you to join our online study groups to become part of a results driven movement, one small part of which is enabling you to compare your UNISA assignments with fellow students. This ensures that you can see how other students are answering, and can then discuss question by question those that you differ on – which improves understanding, retention of information for exams as well increasing your marks for the assignment. 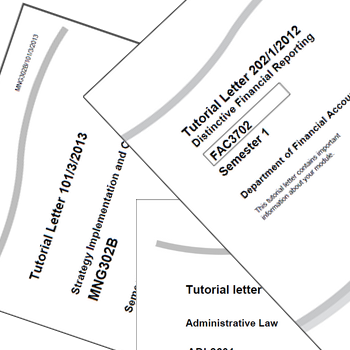 We know that UNISA assignments can be quite a burden if you don`t have your study material – contact us today to find out how to get your tutorial letters and study guides if you have not yet received them from UNISA. As you start going through your coursework, keep your assignment open in front of you. Read the first few questions, and as you start to go through the course material the answers to the question will become clear as you get to them. In this way answer your assignment questions AS YOU READ THE THEORY – which ensure a much higher level of accuracy than if you try to complete them later from memory. Keep reading ahead with the questions, and continue this practice as you go right through the entire course. In this way you are going to improve your memory for these particular facts – many of which will come up in the UNISA exams. Its a simple trick, but extremely effective! Give it a try and let me know how it works for you. And do join us in our study groups for many more great tips and study suggestions, as well as discussion forums, assignment comparison and sharing of great resources such as notes and past papers. Hope to see you in the groups soon! 5 Responses on How to get the best results for your upcoming UNISA assignments 2014"
hi im studyin bed early childhood dev.my mods are prs1023.34.45 n eng1501. Comment Hi i am doing HBEDTRD HBEDECS HBECMSV HBEDTRD HBEBTL6 i need help with my assignments.